Christi Sessa has knocked on doors all around Goshen – on Eighth Street, College Avenue, Main Street — with something similar to a sales pitch. Sessa isn’t selling a product so much as an idea. 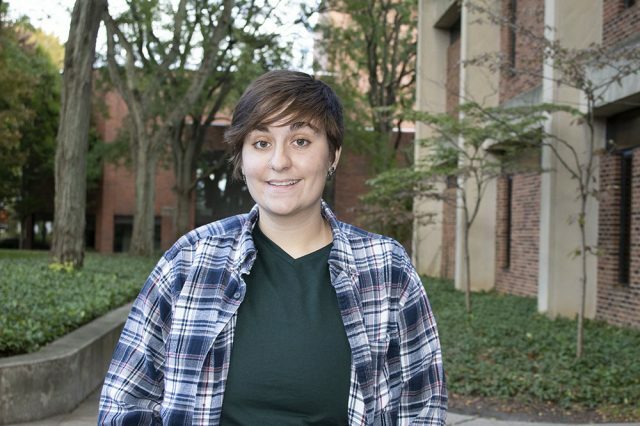 Sessa, a senior peace, justice and conflict studies major at Goshen College, is serving as an intern this semester with the Coordinated Campaign for the Indiana Democratic Party. As part of the internship, Sessa is canvassing voters, going door to door in Goshen to encourage people to vote, in particular for the Democratic Party. Sessa averages 5 to 10 hours of canvassing during the weekend. Other than knocking on doors, Sessa also calls people by phone. But Election Day approaches, Sessa is taking on more of a “captaining canvassing” role, training other people to canvas and then taking the data they gather to get an idea of the households who plan to vote in the election. Along with canvassing, Sessa has been reading up on candidates involved in the race. Sessa sees politics as a doorway to broader concerns. Policies are ingrained in life in many ways that may escape notice. Sessa does not hesitate to speak out on policy issues, whether through stickers on a laptop case or at public events at the state capitol in Indianapolis. On Oct. 11, Sessa went down to Indianapolis with Richard Aguirre, the community impact coordinator for Goshen College, and Rachael Klink, a junior history and peace, justice, conflict studies double-major, to advocate for a hate crime law to be adopted in Indiana. Sessa and Klink were the only students to testify at the meeting of the Indiana Legislature Interim Study Committee on Corrections and Criminal Code.